Her background is as varied as the songs she writes. Abbie has listened to the sweet sound of high lonesome harmonies since her first bluegrass festival at the age of three. Her father, Herb Gardner, is a swing jazz and stride pianist and dixieland trombonist. Watching him laugh as he went off to “work” every day was her first introduction to the joy of being a musician. Abbie’s first full-length recording, My Craziest Dream (2004) is an album of jazz standards featuring her father on piano. It earned her an entry in the 2009 Hal Leonard book “The Jazz Singers: The Ultimate Guide.” Abbie studied classical flute growing up, but once she started playing Dobro in 2004 she found her main instrument. She traveled to Lyons, CO and Nashville, TN to study with Rob Ickes and Sally Van Meter. Always keen on following the vocal part and trying to find the one really perfect note, instead of a dozen okay ones, Abbie is quickly compiling an extensive discography of recording credits. 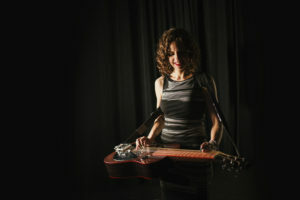 Her own CDs include Honey on My Grave (2006), Bad Nights/Better Days (2008, with Anthony da Costa), and Hope (2011), which features three different kinds of slide guitar (dobro, lap steel and National bottleneck). Abbie has been recognized as an award-winning songwriter, with such accolades as; 2006 Rocky Mountain Folks Festival Songwriter Showcase (2nd place), 2008 Lennon Award Winner (folk) for “The Mind of a Soldier” and 2008 American Songwriter Magazine Grand Prize Lyric Winner for “I’d Rather Be.” “The Mind of a Soldier” was also featured on Lufthansa Airlines in 2010. Abbie has had the honor of being part of the songwriting faculty at the 2010 and 2011 Swannanoa Gatherings and assisting at Reso Summit, Nashville’s Resonator Conference, for the past several years. She wrote and released a song per week for a year as part of the 2013 Real Women Real Songs project and continues to attend Jack Hardy’s Monday night Songwriter’s Exchange in NYC to hone her writing skills. She has been having a blast doing gigs with different bands, backing up her friends and stepping out into the spotlight for her own gigs. Abbie has a brand new solo CD ready to release in January of 2018 and is excited to tour as a solo act in support of that CD.